What does a law librarian do? If you're a frequent law library visitor, you probably see the reference librarians in the Reference Office helping visitors either in person, on the phone, or via email. Do you wonder what we are doing in there - come on in and see for yourself! If you've worked on a research paper, or are a RA, you may have had an individual appointment where a reference librarian provided you with directed guidance and suggestions on how to tackle your work. Do you need some extra help with your research? UW law students are welcome to sign up for an appointment! Outside the law library, you have seen us visiting your classes where we teach you about resources and techniques that will help you in your coursework and hopefully, in your eventual practice of law. You may have become familiar with other law librarians at firms, courts, and other organizations as you've gained experience at internships, summer associate positions, clerkships etc. Did you know that some law librarians are consulted at national and international levels based on their expertise? Our very own Cheryl Nyberg will be speaking at a joint meeting of two sections of the National Conference of State Legislatures next week! Cheryl is widely regarded as a preeminent expert in researching 50-state information and will be on presenting on compiling 50 state information. In case you weren't aware, Cheryl's Subject Compilations of State Laws is published annually and has been hailed as being "unique, priceless and irreplaceable"! Curious about what else law librarians are doing? Feel free to visit us to find out more! How do I print from my laptop? 1. Go to the DawgPrints site: You first need to download the printer driver software from the University of Washington Creative Communications Department website. Here is a link to their printer locations page. 2. Find your printer: Scroll down the list to "Gates Law School" and download the software for L111 or L114 (once you download it for one of them, you'll be able to print to both). 3. Choose your OS: Be sure to select the appropriate software for the kind of computer and operating system that you are running. 4. Install the software: be sure to allow popups from the Dawgprints site, save the software to your computer, and install it. I tried to download the drivers but something's not working! What do I do? Here is a link to the DawgPrints troubleshooting page with some suggestions. If you still can't fix the problem, email Creative Communications with your question: uwcshelp@u.washington.edu. How much does it cost to print? It costs $.12 per page (you can print either double-sided or single-sided) to print in the library. It's $.75 per page to print in color, which you can only do in the alcove next to the law student lounge. You pay for printing with funds that you have added to your Husky Card. Where does my document print out? There are two printers in the law library in our two Copy Alcoves. 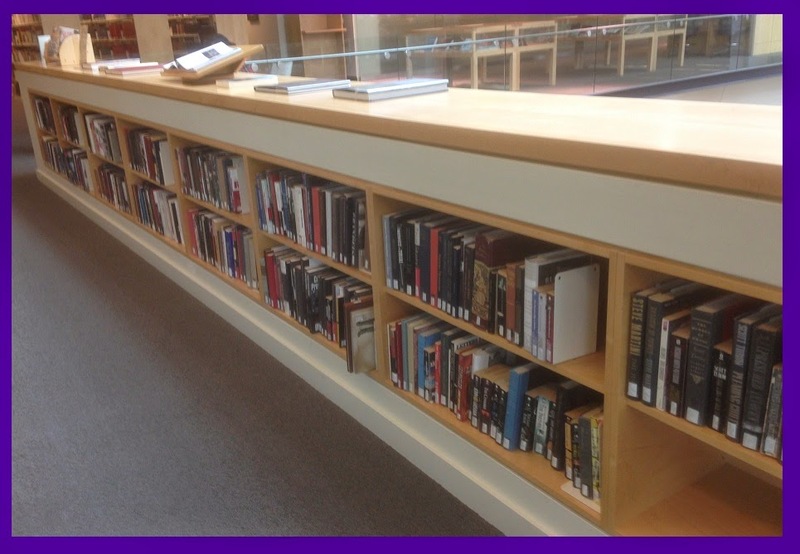 We have a new copy alcove in the Reference Area between the Circulation Desk and the microfiche cabinets. The other is next to the Law Student Lounge. Where can I find even more information about printing and scanning in the law library? Check out the library's Printing and Scanning page for a wealth of information about printing and scanning in the library. September 17 is Constitution Day and Citizenship Day, to "commemorate the formation and signing on September 17, 1787, of the Constitution and recognize all who, by coming of age or by naturalization, have become citizens" (36 USC 106). Because UW is not in session in mid-September, our public commemoration, a complete reading of the Constitution will be held on October 2, 2014, outside the Suzzallo Library 3rd floor Reading Room. You can find more information about the reading and sign up to be a reader here. It's fun, it's moving, it's quietly dramatic. Definitely worth a lunch hour! If you are interested in something really big in the meantime, take a look at The Constitution of the United States of America: Analysis and Interpretation. This massive 2,789 page volume includes an analysis of cases decided by the Supreme Court to June 28, 2012. The digital version on GPO'sFDsys includes cases decided through July 1, 2014. Library of Congress American Memory's Today in History for September 17. Law Library of Congress Constitution Day and Citizenship Day guide. 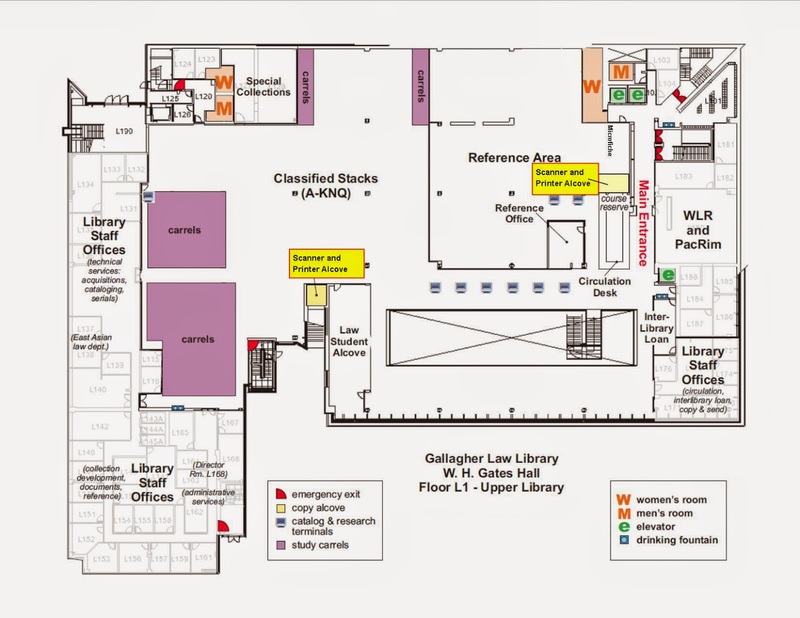 Gallagher Law Library guide to the U.S. Constitution & Related Sources. We've blogged about Westlaw's Headnote of the Day before but would like to point it out to our new 1Ls! Have an excellent year! What sort of law do you want to practice? And what's the practice of law like, anyway? 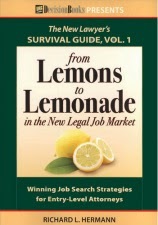 We have just updated our guides, Learning About Legal Careers & the Job Search and Learning About Legal Specialties & Practice Areas, highlighting recent books on those topics. Check 'em out! Screen Star or Social Media Trainwreck? How do you present yourself online: insightful and professional? or not so much? 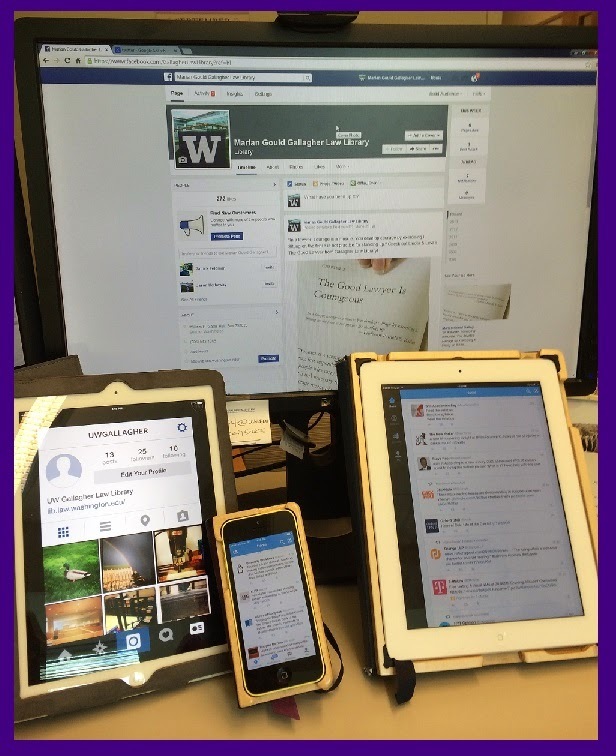 Social media sites displayed on a PC, two iPads, and an iPhone. You can connect with the Gallagher Law Library on this blog, of course. We're also on Twitter and (less actively) Facebook and Instagram. Did you stay up late reading when you were a kid? Did you get totally absorbed in terrific books? Do you still? Good books are still out there for you, if you just pick them up. we have thousands of books that might fit your interests. 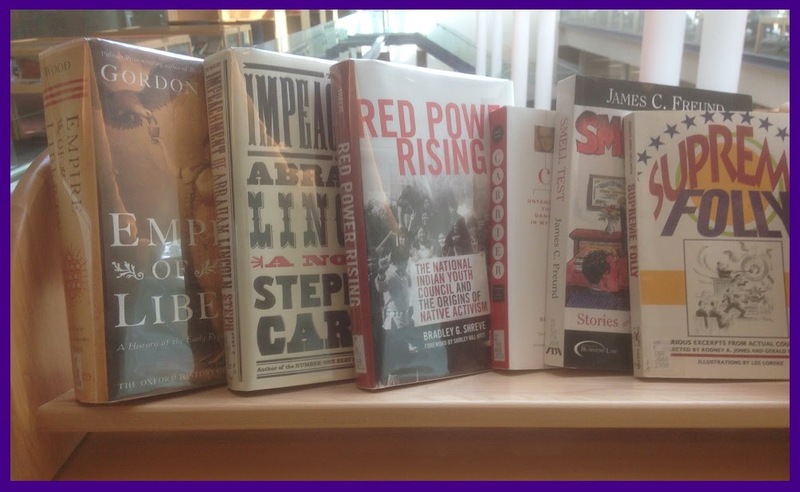 Albert's top nonfiction recommendation from her book project is The New Jim Crow: Mass Incarceration in the Age of Colorblindness, by Michelle Alexander. I thought it was great too. See this blog post. Even though the workload in law school precludes reading huge stacks of unassigned books, many people still find it helpful to keep a book or two going—either to offer a break from all the other reading or to complement it. I could go on and on about this. Oh, wait! I already have! See Good Reads in the Law Library?, 93 Law Libr. J. 517 (2003) and Bitten by the Reading Bug, 105 Law Libr. J. 113 (2013).